Every so often, a commentary comes to the attention of the student of Scripture that strikes him or her as being head and shoulders above the crowd. Steven Charles Ger's Acts: Witnesses to the World has struck this editor and AMC's board secretary Mottel Baleston in just such a way. For this reason, we have decided to present Acts in its entirety - not just for the wealth of information that may be gained from its study, but, as Mottel stated, as a model for how a Bible study ought to be done. Links to previous increments of Acts: Witnesses to the World may be found in our Library. As discussed above, Acts is not a theological treatise. Nonetheless, a considerable amount of theological points may still be discerned throughout the narrative. There are approximately thirty direct quotations from the Hebrew Scripture and innumerable allusions to those scriptures within the speeches of Acts. Paul, Peter, James and Stephen all quote the Hebrew Scripture to support and prove their arguments that Jesus is the prophesied Messiah. There is speculation as to which translation of Hebrew Scripture was used by the early church. The Biblical quotations in Acts are primarily from the Septuagint. The Septuagint is the Greek translation of the Hebrew Bible (the Old Testament), compiled in the second century BC. There are slight discrepancies between the Hebrew text and its Greek translation, and the Acts quotations generally agree with Septuagint variations. This preference for the Greek translation may or may not indicate that the Septuagint was the translation of the Hebrew Bible utilized by the apostles. It is possible that Luke may have simply adapted the apostles' original Hebrew Bible quotations to the version of the Bible used by Theophilus and a subsequent Greek audience. By the time Luke wrote Acts, the locus of the church was no longer in Israel but, rather, was in the larger, Greek-speaking, Gentile world. Additional ambiguity is provided by the occasional correspondence of some of the Acts quotations to a version of the Hebrew Scripture found within the Dead Sea Scrolls. The Dead Sea Scrolls contain a Hebrew language version of the Biblical books that predates the standard Hebrew text by one thousand years. This version also varies somewhat from the standard Hebrew text. The discovery of these ancient documents creates the possibility that an alternate Hebrew version of Scripture was in use in the first century. Ultimately, no conclusion may be drawn, based on this evidence, as to which version of Hebrew Scripture the apostles ordinarily read, although the Septuagint is clearly the primary source of Old Testament quotations in Acts. Over the centuries, skeptics of Christianity have made much of the claim that there is no explicit statement in Acts that clearly identifies Jesus as God. They reason that the lack of such an explicit propositional affirmation is a strong argument against the doctrine of Jesus' deity. If the early church truly believed that Jesus was God, then the glaring absence of such a divine claim cannot be ignored. Nevertheless, the lack of an explicit propositional statement in Acts which definitively equates Jesus with God does not mean that that doctrine is absent from Acts. This is, after all, not a book of propositional affirmations, but a narrative account of how Jesus is demonstrably the "Lord of all" (10:36), continually identified with God. Luke primarily establishes Jesus' divine identity by means of the signs and wonders performed in his name by His emissaries. More eloquently than any mere statement, it is these miracles, studded throughout the Acts narrative, which confirm that Jesus is God. In light of the portrait of Christ drawn by Luke, a direct propositional statement affirming Christ's equality with God would have proven redundant! This is abundantly evident when systematically collating all that is stated about Jesus within Acts. To list two examples, Luke interchangeably uses the terms, "Holy Spirit" and "Spirit of Jesus" (Acts 16:6-7) and in conversation, Paul equates the shed blood of Jesus with God's own blood (Acts 20:28). While not propositional statements, per se, they obviously express Jesus' deity to all with eyes to see. For example, the particular christological emphases of Peter are often different from that of Paul, although there is also overlap between them. In addition, what the speakers choose to emphasize about Jesus is often dependent on the particular audience they are addressing at the time. It comes as no surprise that the vast majority of the terms and concepts used of Jesus in Acts derive from the Hebrew Scripture. Quite naturally and intuitively, the apostles almost exclusively use Jewish categories and terminology in speaking of Jesus' identity. They extensively quote and make allusion to a plethora of messianic prophecies and covenantal promises. In turn, their Jewish audiences, culturally saturated in the Scriptures, would have been highly attuned to both the apostle's christological terminology and its originating Scriptural referent. 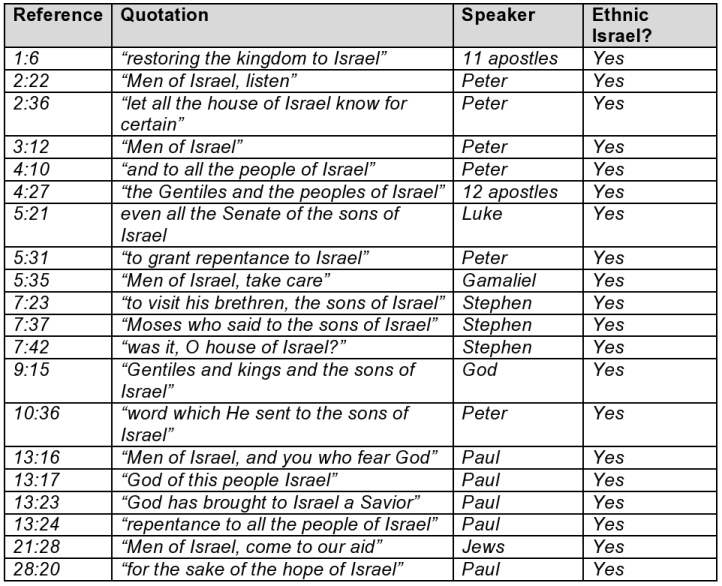 When addressing the Gentiles, both Peter and Paul must stretch beyond familiar Jewish, biblical terminology, and describe Jesus by using universal categories and concepts that could be grasped by their audience. Most Gentiles were unfamiliar with the Torah or Hebrew prophets, so it would have been less effective to quote Old Testament promises than to relay the basic life story of Jesus and His resurrection. The following discussion will focus on "who said what to whom" about Jesus, concentrating on the primary preachers: Peter, Paul, Stephen and Philip. Luke's own narrative voice will be omitted, as will the numerous unqualified, "plain vanilla" references to Jesus. The emphasis will be on the context and not on individual word counts. CHRIST, JESUS CHRIST: Of course, the vast majority of references to Jesus are in his capacity as the Christ, the Messiah, the anointed one, the promised representative of God who was sent to deliver His people. It must be remembered that although seemingly used in certain instances as a "last name" for Jesus, in reality, Christ is his title and office. Christ is an all-weather term for Peter and He uses it with all audiences. He uses Christ, and the specific God's Christ and Israel's Christ when evangelizing Jewish crowds in the Temple (2:31; 3:18; 3:20) and Jesus Christ when healing a Jew (9:34) and witnessing to a Gentile (10:36, 48). On occasion, Peter emphasizes the full authority of the name, Jesus Christ the Nazarene, when healing the lame man (3:6) and defending himself before the Sanhedrin (4:10). To Paul, Jesus is simply Christ when debating or preaching to Jews (9:22; 17:3; 18:5) and Agrippa II (26:23). He specifies Jesus Christ when exorcising a demon (emphasis on the name [16:18]) and Christ Jesus (emphasis on the title) defending himself to Felix (24:24). Christ is used by the apostles when teaching in Jerusalem (5:42), by Apollos in witnessing to Jews (18:28) and by Phillip witnessing to Samaritans (8:5). Philip also uses Jesus Christ with the Samaritans (8:12). The more abstract conceptual God's Anointed is substituted for the title of Christ, on two occasions: during Peter's witness to the Gentiles gathered in Cornelius' home (10:38) and while the apostles are praying (4:27). LORD JESUS, LORD JESUS CHRIST, LORD AND CHRIST, LORD OF ALL: As Acts emphasizes that Jesus is the Messiah, it also stresses Jesus' lordship. When Peter, Paul and their associates use Lord in reference to Jesus, they most assuredly do not mean to communicate its pedestrian sense of "sir" or "master." From the very beginning, the apostolic witness was that Jesus is appropriately to be identified with the Lord God himself. Jesus rules with God and possesses divine authority over salvation and deliverance from sin. 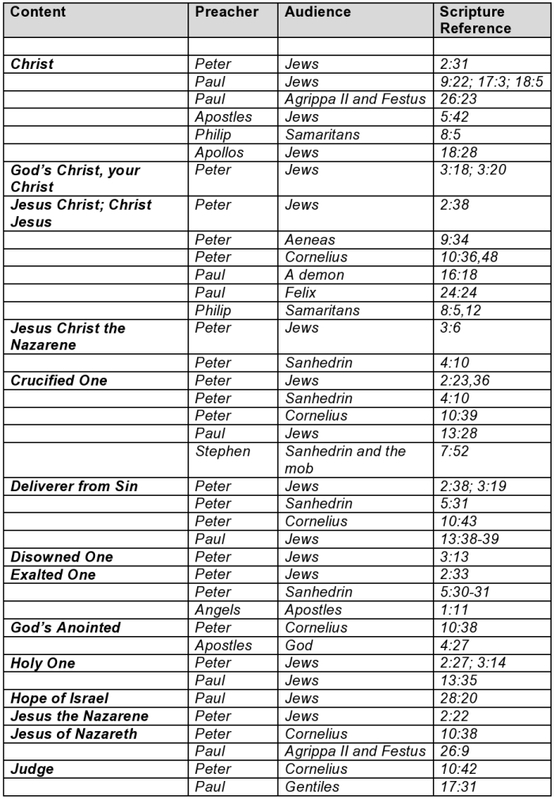 Lord Jesus (1:21; 15:11) and Lord Jesus Christ (11:17) are terms Peter uses when addressing Jewish believers. Peter's unique combination Lord and Christ is used in Jewish evangelism and portrays Jesus as God's co-regent, intimately sitting in God's presence and ruling over creation with Him (2:36). His equally distinctive Lord of All is used in his groundbreaking evangelistic encounter with the Gentile family of Cornelius to demonstrate that Jesus freely exercises God's authority over all creation (10:36). The way the familiar Lord Jesus is used by Stephen, immediately prior to his martyrdom (7:59-60), praying for Him to "receive his spirit," is the strongest indication of Jesus' deity in Acts. The term is widely used throughout the narrative. Lord Jesus is employed by Paul in his witness to his Gentile jailer (16:31) and when addressing the church (20:24, 35; 21:13), by Philip in his Samaritan witness (8:16), by Ananias when first meeting Saul (9:17), and by the church at Antioch in their Gentile witness (11:20). JESUS THE NAZARENE, JESUS OF NAZARETH: This title squarely locates Jesus within historic time and geographic space. In addition to the aforementioned use by Peter of the authoritative Jesus Christ the Nazarene (3:6, 4:10), Peter uses the simpler Jesus the Nazarene at Pentecost (2:22) and Jesus of Nazareth with Cornelius (10:38). Paul uses Jesus of Nazareth before Agrippa II (26:9). RESURRECTED ONE: This designation is a not a name or title, but rather a concept which is consistently applied to Jesus. The apostles were witnesses of Jesus resurrection, and this idea is heavily emphasized by both Peter and Paul in a variety of contexts. For Peter, Jesus as the Resurrected One was incorporated into his witness to Jews (2:24, 32; 3:15), Jewish leadership (4:10) and Gentiles (10:40). For Paul as well, this concept was part of his commissioned witness to Jews (11:30; 17:3), Gentiles (17:18, 31), and kings (26:23). CRUCIFIED ONE: Related to Jesus' resurrection was, of course, his crucifixion. This concept was an essential component of the gospel witness of Peter, Paul and Stephen. Peter included Jesus as the Crucified One when evangelizing Jews (2:23, 36) and Gentiles (10:39) and when accusing the Sanhedrin of Jesus' murder (4:10). Stephen, as well, reminded the Sanhedrin of Jesus' crucifixion (7:58), and Paul incorporated it into his Jewish evangelism (13:28). PROPHESIED ONE: Vital for both Peter and Paul was the fact that Jesus was the fulfillment of the Hebrew Scriptures' messianic prophecies. Peter underscores this point with both Jews (3:24) and Gentiles (10:43). Paul follows that same pattern, with Jews (13:23, 33-37; 17:3; 28:23) and before Agrippa II (26:22). SERVANT OF THE LORD: The mission of the Servant of the Lord is the dominant theme of the second half of the prophet Isaiah's writing. God called this servant to restore the nation of Israel and to be a light to the nations. Peter applies this complex of prophecies to Jesus while preaching in the Temple courts (3:13, 26). Philip does so as well while studying Isaiah with the Ethiopian (8:35). The apostles reference this title for Jesus during prayer (4:27, 30). In addition, the narrative of Acts, like the gospels, is studded with allusions to Jesus' fulfillment of the Servant of the Lord passages. SUFFERING ONE: One of the most powerful messianic prophecies highlighted in Acts is that of the suffering servant (Is. 52:13-53:12), the one who by dying, would make intercession with God on behalf of Israel. This concept of a prophesied suffering messiah relates to the titles Crucified One, the Prophesied One and the Servant of the Lord. Peter emphasizes the suffering of Jesus in his Jewish witness (3:18), as does Paul, who also uses the phrase in his Jewish witness (17:3), as well as before Agrippa II (26:23). DELIVERER FROM SIN: This is presented in Acts as one of the key functions of the Messiah: the ability to forgive sin. This concept is integral to Peter across the board, whether witnessing to Jews (2:38; 3:19) Gentiles (10:43) or the Sanhedrin (5:31). Paul refers to Jesus as the Deliverer from Sin and confidently places Jesus above the Torah (13:38-39). RIGHTEOUS ONE: Just as with the Crucified One, this is a messianic term that Peter, Paul and Stephen all reference. The term originates in Isaiah's Suffering Servant prophecy (53:11) and is the result of the Servant of the Lord having become the Suffering and Crucified One. This term would have particularly resonated with the Jewish audiences of Peter (3:14), Paul (22:14) and Stephen (7:52). SAVIOR, ONLY SAVIOR: Although a focus on the term Savior has been fashionable within the evangelism of our contemporary churches, the relatively restricted use of Savior by the apostles is surprising. Within Acts, it is but one facet among many of Jesus' identity. This suggests, perhaps, that our contemporary view of Jesus' identity is not as muscular as was the first century church's. While standing before the Sanhedrin for the first time, Peter calls Jesus the Savior (4:12) and on the second occasion, he emphasizes that Jesus is the Only Savior (5:31). Paul uses this title while witnessing in the synagogue of Pisidian Antioch (13:23). PROPHET LIKE MOSES: Peter's preaching was distinctively steeped in the messianic prophecies of the Hebrew Scripture. In Acts, only Peter, the apostle to the Jews, explicitly draws the important connection between Jesus and the promised Prophet Like Moses (3:22). Stephen quotes the prophecy, but does not explicitly make the connection to Jesus (7:37). Perhaps he would have further developed his argument had the Sanhedrin not executed him. SON OF MAN: Although by far the most popular self-designation of Jesus in the gospels, this profoundly messianic title is only used once in Acts, by Stephen, just prior to his execution at the hands of a Jewish mob (7:56). 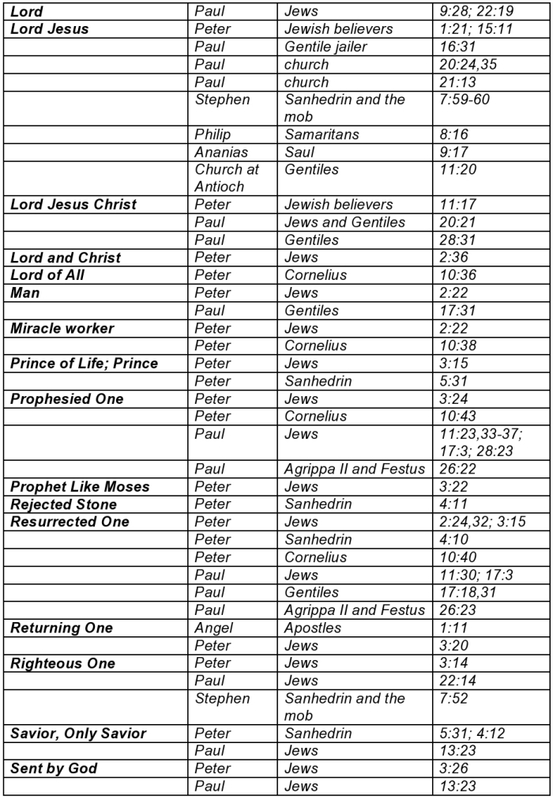 ADDITIONAL DESIGNATIONS USED BY BOTH PETER AND PAUL: Both Peter in the Temple (2:30) and Paul in the synagogue (13:33) make identical arguments that Jesus is the Messiah based upon His being the prophesied Son of David. Jesus' humanity was highlighted by His being called a Man by Peter in his Jewish witness (2:22) and Paul in his witness to Gentiles (17:31). Finally, both apostles incorporated into their Gentile evangelistic message that Jesus was soon to serve as Judge. For Peter, speaking with Cornelius, Jesus would judge the "living and the dead" (10:42) and for Paul, addressing the Athenians, Jesus was appointed by God to judge "all mankind" (17:31). announced at Jesus' ascension (1:11). The angels also announced that Jesus would soon be the Returning One (1:11), and Peter boldly broadcast to his people that this Jesus would return to Israel to establish His promised messianic kingdom (3:20). ADDITIONAL DESIGNATIONS UNIQUE TO PAUL: Paul's initial preaching within the synagogues is characterized by his powerful proclamation that Jesus is the Son of God (9:20; 13:33). His later preaching is likewise characterized by his unique designation of Jesus as the messianic Hope of Israel (28:20). Luke reveals a great deal concerning the Holy Spirit's active ministry in the life, guidance and expansion of the church. For Luke, the Holy Spirit, the "promise of the Father" (1:2, 2:33), was God's gracious gift (2:38, 5:32; 8:18; 10:45; 15:8; 19:2). The pouring out of this gift upon believing Jews and Gentiles (2:17; 10:45; 18, 33) was understood by the church to be the "baptism of the Spirit" (1:5; 11:16). An alternate phrase that describes Spirit Baptism is "to receive the Spirit" (2:38; 8:15, 17, 19; 19:2). The apostles' baptism of the Spirit at Pentecost marked the initiation of the church age (11:15). Baptism of the Spirit is primarily experienced in Acts within a national or corporate context and is indicative of incorporation into the church of identifiable ethnic or national groups. This corporate baptism of the Spirit is accompanied by the specific gifts of tongues and prophecy (2:3, 10:44-46; 19:6). The Holy Spirit is the great unifier and equalizer in Acts, demonstrating that Jews and Gentiles alike have an equal role in God's program and an equal place in His community. Alternatively, the Holy Spirit's ministry to individual believers is primarily that of the "filling (controlling) of the Spirit" (2:4; 4:8,31; 6:3-5; 7:55; 9:17; 11:24; 13:9,52). In Acts, believers speak by means of the Spirit (1:2; 4:31; 8:29; 10:19; 11:28; 13:2; 20:23; 21:4,11), and the Spirit directs and appoints them in ministry (8:29,39; 10:19; 11:12; 13:2,4; 15:28; 16:6-7; 20:28; 21:4). He also comforts the church (9:31) and is the divine collaborator with the authors of Scripture (1:16; 4:25; 28:25). The Holy Spirit in Acts was also a participant within the ministry of Jesus in several ways. Jesus spoke by means of the Spirit (1:2), received the promise of the Spirit (2:33) and was anointed by the Spirit (10:38). The Spirit also bears witness of Jesus (5:32). Angels play a crucial supporting role in the advancement of the gospel and the expansion of the early church. In Acts, angels are portrayed as God's servants, messengers and foot soldiers who relay divine instruction (1:10-11; 8:26; 10:3-7; 27:23-24), defend and protect God's people from harmful circumstances (5:19; 12:7-10, 15), and execute God's judgment on His enemies (12:23). See Table 6. Demons are far less predominant in Acts than in the gospels. In Acts, demons are a cause of disease (5:16; 19:12), possess individuals (16:16) and may only be exorcised by legitimate believers in Jesus (16:18; 19:15). The sole reference to Satan indicates that Christians may be satanically influenced and even controlled (5:3). Paul's address to the scripturally illiterate Athenians affirms that each man is created by God (17:24) and descends from Adam (17:26). The apostles in Acts neither pull punches nor mince words when it comes to the gospel. They are constantly portrayed as preaching that Jesus is the exclusive means of salvation (4:12). Luke's "good news" is that Jesus is God's only authorized agent of salvation for both Israel and the nations, Jews and Gentiles alike. Sinners may only find forgiveness through belief that Jesus is the divine forgiver of sin (Acts 13:38-39). When the apostles are shown preaching the gospel, their emphasis is not focused on theological details, the specific "ins and outs" of what Jesus had accomplished and exactly how He had accomplished His work of salvation. The apostles simply call for a response to the prophesied, resurrected and exalted Messiah. Luke's account is much more focused on the person of Jesus than on His work. For a detailed, systematic analysis of exactly how Christ's death on the cross eradicated the power of sin and death, one must look to the epistles of Paul, not the adventures of Paul. The advance of the church is the main subject of the book of Acts. Luke depicts the universal church of all believers (5:11; 9:31) as well as individual, local churches (8:1; 16:5; 14:23; 13:1; 20:28). The church, while birthed in Israel and incorporating the faithful remnant of Israel, is not a continuation of Israel. Acts traces the Jewish leadership's developing antagonism from initial suspicious rivalry (4:1-2) through its culmination into aggressive hostility and murderous intent (7:58; 8:3; 12:2; 25:2-3). The church stands apart as a distinct community from Judaism and Israel, which incorporates Jewish, Samaritan and Gentile followers of the Messiah on an equal basis. This Messiah is both the hope of Israel (28:20) and the Lord of all (10:36). Acts highlights church participation in two ordinances, baptism and communion. As demonstrated throughout, baptism is by means of some level of immersion in water and is only designated for believers (2:38, 41; 8:12, 13, 16, 36-39; 9:18; 10:46-48; 16:33; 19:1-6; 22:16). Although participation in the eucharist is not described in Acts, allusion is made to the ordinance (2:42, 46; 20:7, 11). Acts explicitly affirms the doctrine of the "second coming," that Jesus will return again, this time to rule and reign (1:11, 3:19-20). The church believed that the "last days" had been initiated by the outpouring of the Spirit on Pentecost (2:17) but while the Messiah's return was imminent, it would not be immediate. We find in Acts a sort of "tempered imminence;" an expectation of Jesus' imminent return, balanced, or tempered, by His commissioning His apostles to evangelize the entire world. Rome was not built in a day and, according to Luke, neither was Rome reached before twenty-nine years had passed. When the Messiah returns, He will be the harbinger of Israel's restoration (1:6; 3:21) and corporate salvation (2:16-21). In addition, with Jesus' return will also come His judgment of all humanity (17:31). First, through the agency of her leaders, Israel corporately rejected Messiah. Therefore, judgment is imminent for that generation (2:22-23, 36; 3:13-18; 4:10-11). Second, the eventual establishment of the messianic kingdom is a future certainty (1:6; 3:21). The kingdom is predicated upon Israel's corporate reception of their Messiah, at which point He will then return to rule and reign (3:19-20). Third, the gospel has particular resonance and is especially applicable to Jewish people (Rom. 1:16). The early church prioritized Jewish evangelism. This is true both historically/chronologically, as the church expanded its geographic borders, and methodologically, as standard and sustained evangelistic strategy (13:4, 14; 14:1; 16:11-13; 17:1-2, 10, 16-17; 18:1, 4, 19; 19:1, 8; 28:17). Fourth, it is perfectly appropriate for individual Jewish believers to maintain Jewish customs and traditions (3:1; 21:26) so long as the observance of those customs and traditions is not viewed as obligatory for other Jewish or Gentile believers (15:1-29). No Jewish customs or traditions contribute to salvation; it is faith alone that saves both Jew and Gentile (Rom. 1:16; Eph. 2:8-9). However, it is incumbent on all Jewish believers, as Jews and thereby heirs of the covenant promises made to Abraham, to observe circumcision (Gen 17:1-22; Acts 16:1-3). Such observance predates Moses and Torah and is for the purpose of identification as an heir and recipient of God's national promises to Israel inherent within the Abrahamic Covenant. 6. List ten titles or designations of your choice given to Jesus in Acts. Steven Charles Ger, Th.M., is a fourth generation Jewish believer. In addition to Acts: Witnesses to the World, his body of work includes a biblical commentary on Hebrews and co-authorship of The Popular Bible Prophecy Commentary. He is also a contributing author to The Gathering Storm and the Zondervan KJV Commentary: Old Testament. He is the former host of the weekly radio show, "The Jewish Heart of Christianity," and has appeared as a guest expert on both radio and television. Steven's main work is directing Sojourner Ministries, an organization dedicated to exploring the Jewish heart of Christianity. Autographed copies of Acts: Witnesses to the World may be purchased from the Sojourner Ministries website at www.sojournerministries.com.